Originally printed on April 13, 2019 in the East Anglian Daily Times. 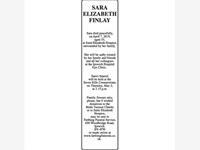 SARA ELIZABETH FINLAY Sara died peacefully, on April 7, 2019, aged 55, at Saint Elizabeth Hospice, surrounded by her family. She will be sadly missed by her family and friends and all her colleagues at the Ipswich Hospital Eye Clinic. 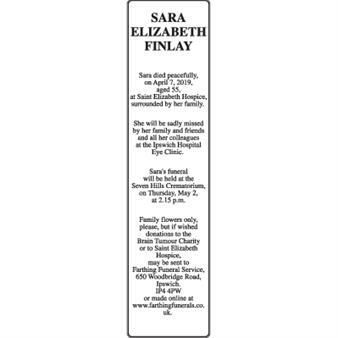 Sara&apos;s funeral will be held at the Seven Hills Crematorium, on Thursday, May 2, at 2.15 p.m. Family flowers only, please, but if wished donations to the Brain Tumour Charity or to Saint Elizabeth Hospice, may be sent to Farthing Funeral Service, 650 Woodbridge Road, Ipswich. IP4 4PW or made online at www.farthingfunerals.co.uk.